Archduke Leopold Salvator of Austria is denying reports that his daughter, Archduchess Maria Immaculata is about to enter a convent, according to a direct wire to the Los Angeles Times. The 20-year-old archduchess undertakes charity work, and prefers her "books to society, the lanes and open fields to the traveled roads, and the cottages of the peasantry to the palace of the nobles." The rumors began when Austrian newspapers published a photo of the archduchess wearing "the garb of a Benedictine nun." The photo, however, was taken some years ago by her father, when she attended a children's fancy dress party. 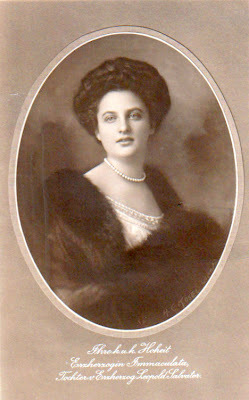 Archduchess Maria Immaculata is the second child of Archduke Leopold Savor and his wife, Infanta Blanca of Spain, daughter of the Carlist pretender the Duke of Madrid. She was named for her paternal grandmother, Princess Maria Immaculata of Bourbon-Two Sicilies, who died in 1899.